his total guiding experience is over 25 years. His repeat business is off of the charts!!!! I want to share with you the story of Bob and Sandy Gunnarson and why they keep coming back year after year! Tom had the pleasure of meeting the Gunnarsons at the first show he worked in Duluth, MN back in 2000. The Gunnarsons who resided in Duluth, had always wanted to fish Lake of the Woods, but were looking for the right opportunity to do so. Tom was able to put together a package for them that they couldnt refuse, and they didnt. As every person does they were looking to just check things out on Lake of the Woods. While they were here they wanted to checkout a few other resorts besides the Wigwam. Their first trip to the Wigwam Resort on Lake of the Woods was such a memorable one that they didnt go look at other resorts, and it has brought them back an astonishing 34 times in 9 years. On one of their trips to visit us at the Wigwam Resort on January 21, 2002 Sandy caught a 30 1/2 , 10.6 lb Walleye, which is currently mounted in the lobby of the Wigwam Resort Lodge. Each time they come back they bring new people with them, and their guests keep coming back themselves year after year. Tom was able to put them on the fish both days and they had a blast. The proof is in the pictures. he has an abundance amount of fishing knowledge that needs to be tapped. 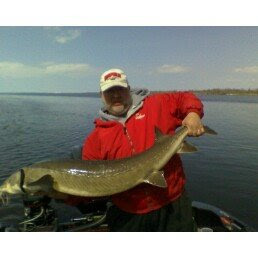 Give us a call at the Wigwam Resort and let Tom PUT YOU ON THE FISH! make sure your on the bottom, because thats where the fish are at! I will treasure them all for the rest of eternity!